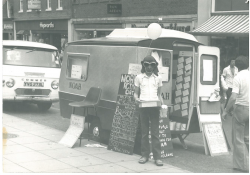 Voluntary Norfolk pioneered volunteering locally when in 1969 a group of young volunteers formed NOAH – The Norwich Organisation for Active Help, travelling the city towing a Volunteer Bureau in a tiny caravan, from which they encouraged the community to volunteer. From this time an important element of our work has been the provision of volunteers to assist older and vulnerable people to live more independently within the community and, by so doing, helping to take the strain off the county’s health and social care services. In the years since we were established this need has grown – as people live longer, families disperse and statutory services continue to face intense pressure – and so this continues to be a core part of our work.